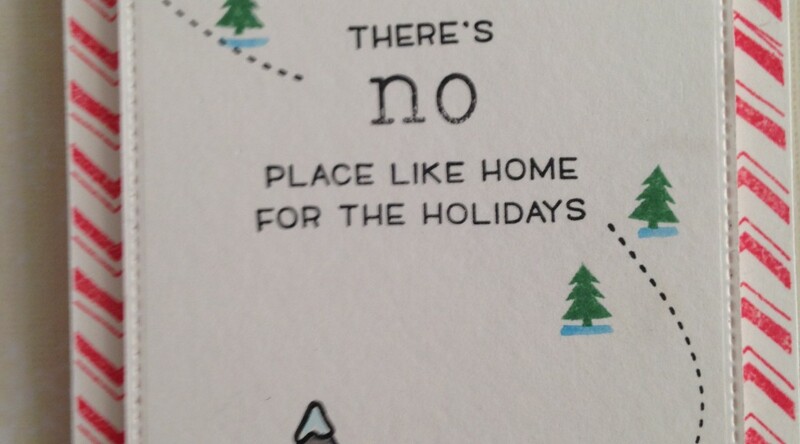 My mother in law loved her house warming card so much that she asked if I would make her holiday cards this year. I based the design on the orginal card. I did try to simplify things where I could as I was making 36 of them. Extra Details: I started by creating all 36 card bases. I used 3 shades of blue paper and basically cleaned my stash out of all blue cardstock. 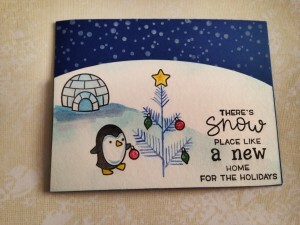 On each card base, I stamped the snowy backdrop in Yeti White Pigment ink. While those were drying, I die cut each snow hill. I used the Speech Bubble Border die and trimmed off the little triangle. 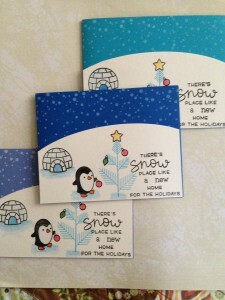 Next, I added the stamping to the snow hills. I started with the blue tree. Then sentiment was stamped all at one time. 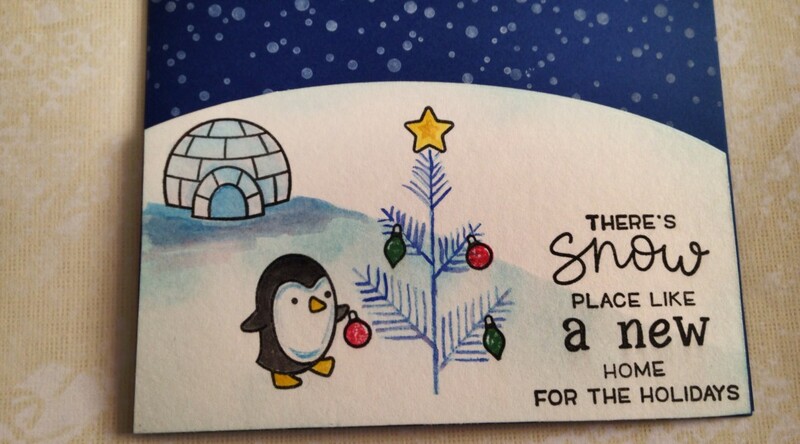 Then, I added the penguin and igloo. The ornaments were last. I added the color to the ornaments with Memento Dew Drop inks and the solid stamps. Using my water color pencils I added color to the stamped images. The pencils made it really easy. I created an assembly line; color everything that needed to be blue on all 36 panels, use a water brush to blend out the blue areas on all 36 panels, then move on to the next color. By the time I had finished the last panel, the first panel was day and I could add the next color. 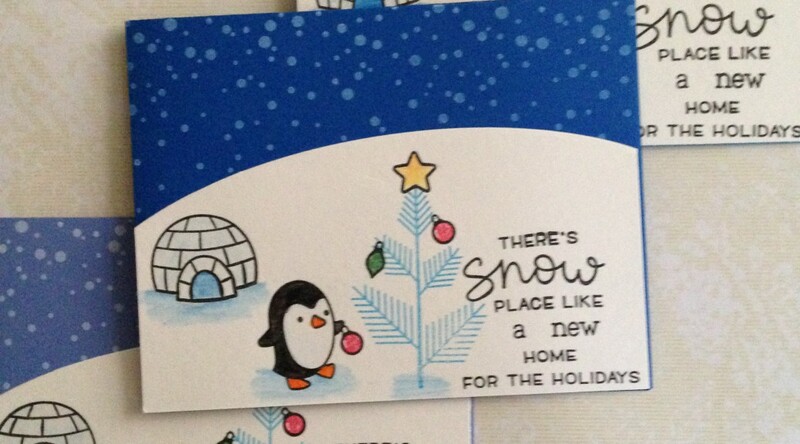 Once all the coloring was done and dry, I added the snow hills to the card bases. 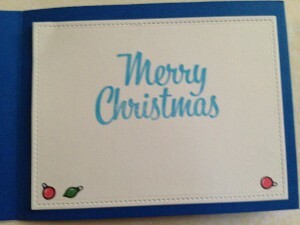 I added a white panel to the inside of the card as well with a Christmas message and room for a short note. I cut each panel out with a stitched rectangle and just added the stamping. It is time to make birthday cards at my house again. Both of my kiddos have a friend with a birthday in the coming week. This is the card my son made for a little girl in his class. Her favorite colors are purple and pink. 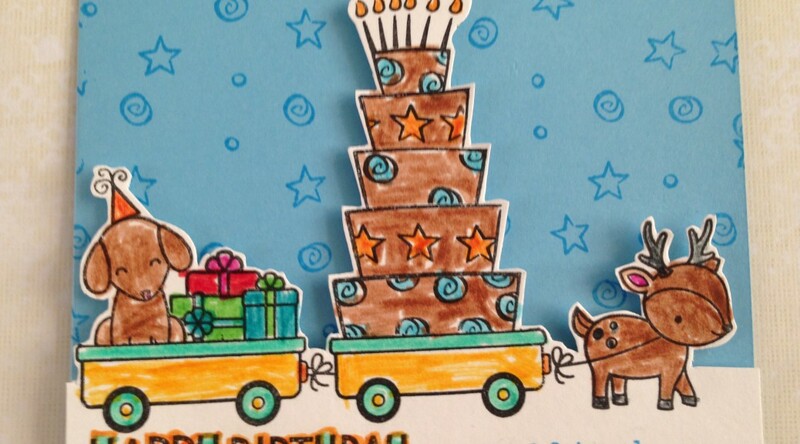 This is the card my daughter made to mail family friend for his 6th birthday. Extra Details: We started by stamping the images on a panel of water color paper. I used some masking on the deer card. Once the ink was dry, the kiddos colored their images with Crayola markers. While, the kiddos were coloring, I added some images to the colored card bases. For the pink card, we die cut the images with a Polaroid die. I die cute two extra frames and layered them together with liquid glue. We glued the Polaroid frame to the card base, added the inside picture and the card was done. For the blue card, I fussy cut the images along the top edge. I had smeared some ink while stamping on the top of the panel, so I just cut off the smeared part off. 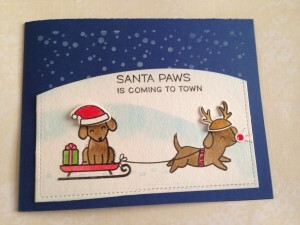 We attached the stamped piece with dimensional glue dots and the card was done. I found my kiddos Spirograph today. 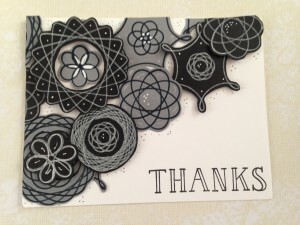 I loved playing with the Spirograph with I was a kid, and was excited to use it again. 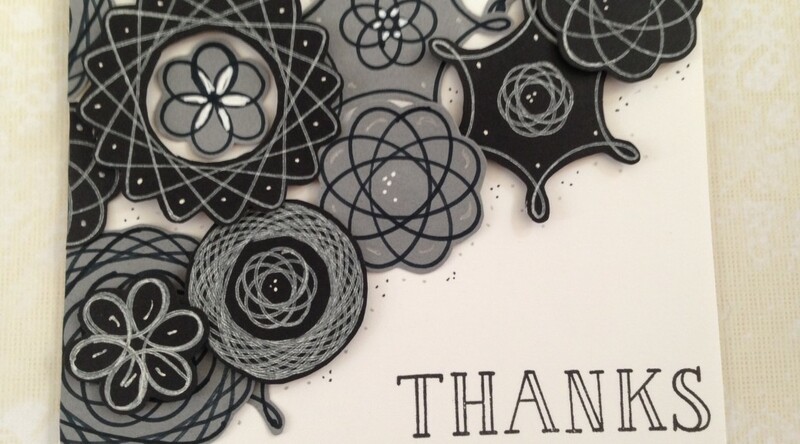 Extra Details: I started by creating some “flowers” on gray and black cardstocks. I used a white gel pen and a black marker to create the “flowers.” I let the inks dry and then fussy cut the flowers out. I added some details to the flowers with a white and silver gel pens. I adhered all the flowers to the card base. I used liquid glue, DIY foam dots, and dimensional glue dots. I trimmed anything that hung over the edges with my scissors. I also added some dots to the card base with the black and silver pens. 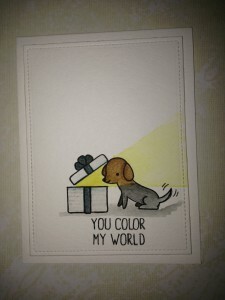 Lastly, I added a sentiment and the card was done. 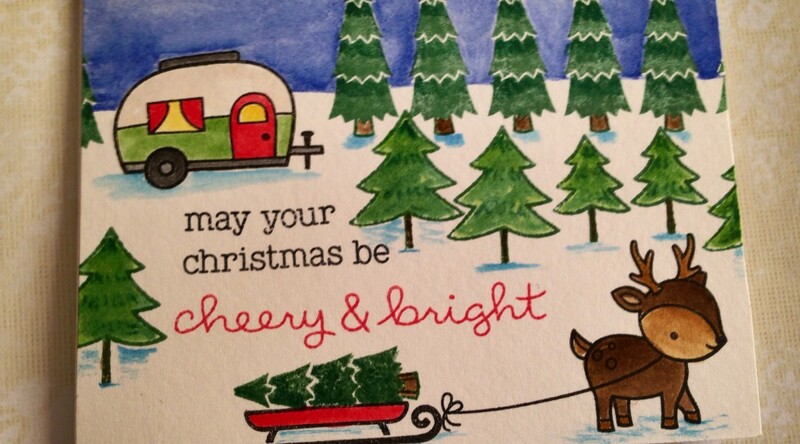 I have been watching a lot of Christmas card videos on YouTube this week. 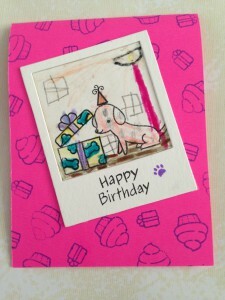 Julie Ebersole made a card using some tiny little stamps and I knew I wanted to make a similar card. Extra Details: I began with a left over piece of water color paper that is slightly thinner than a standard A2 card base. I stamped the sentiment first. I used a sentiment from Lawn Fawn’s Snow Cool Set, but I replaced the work Snow with No that I made with an alphabet set. I then stamped the village and the car. Next, I added the dotted line and the trees. I used Distress Inks to water color all of the images. While the stamped panel was drying, I added some red chevrons to the card base. I was going for a candy strip look, but didn’t have any stamped that looked exactly the way I wanted, so I got creative. Next, I added some stitched lines to the stamped panel’s long edges. Lastly, I popped the stamped panel up on fun foam before adding it to my card base. 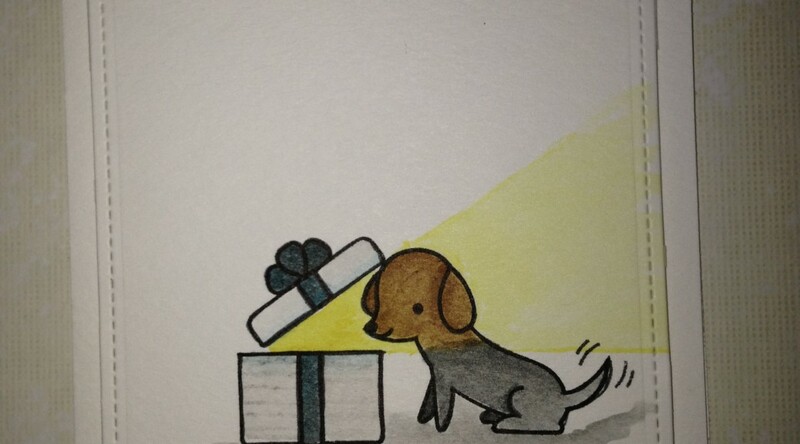 Then the card was finished. I’ve seen a lot of fun new holiday stamp sets. 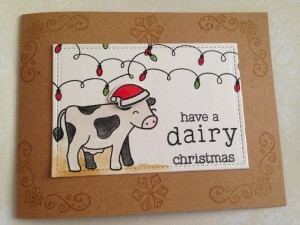 I love the new Art Impression’s Dairy Christmas Stamp. 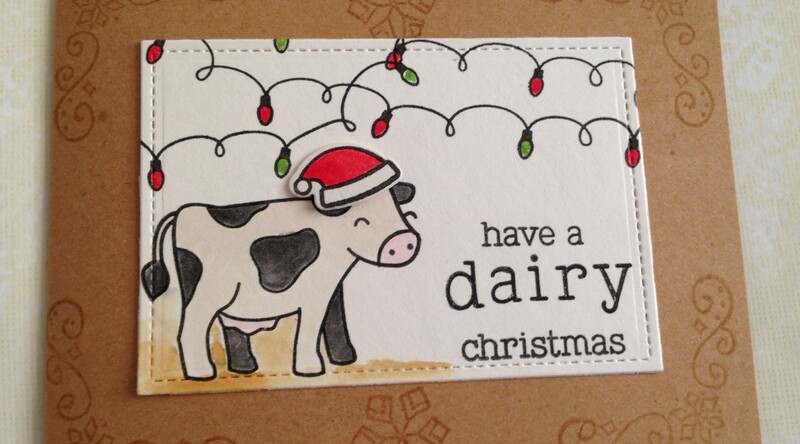 After seeing that stamp set, I knew exactly what card I wanted to make to send to my uncle who is a farmer. Extra Details: I began with a panel of water color paper that I die cut with a stitched rectangle. I stamped the cow and lights on the panel. I added a custom sentiment that I created from an alpha stamp set and another stamp set. I stamped the hat on a scrap of water color paper and die cut that out. I used Distress Inks to water color all of the images. I created a kraft card base while the ink was drying. 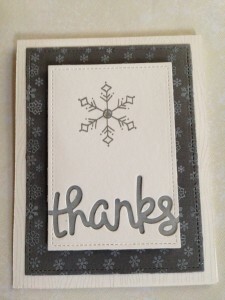 I added some snowflake detail with Versa Mark Ink to the card base to give it some interest. I added the stamped the panel to the card base and was done. I don’t make many Christmas cards to send out, because I typically send photo cards of my kiddos. However, every year I always make a few because sometimes I can’t fit my whole idea on to a tag. Extra Details: I started with a panel of water color card stock that I die cut with a stitched rectangle. I also die cut a slope on the top edge of the panel. Next, I stamped the images and sentiment on the panel. I stamped the hats and red nose on a scrap of water color paper and die cut them out. I also hand cut another slope from another scrap of paper. Using the slope and some Distress Ink, I added a snow bank to my scene. I didn’t worry about masking the dogs because I knew I would be coloring them a much darker color and the ink blending would show. I used Distress Inks to water color all of the images. I also added the paw print in the snow with a very little blue Distress Ink. I attached the hats with some dimensional glue dots and the nose with a glue pen. While, the panel wad drying, I worked on the card base. I cut and folded some dark blue card stock into a standard A2 card base. Using Post It tape, I masked the edges along the sides and top to match the stamped panel. 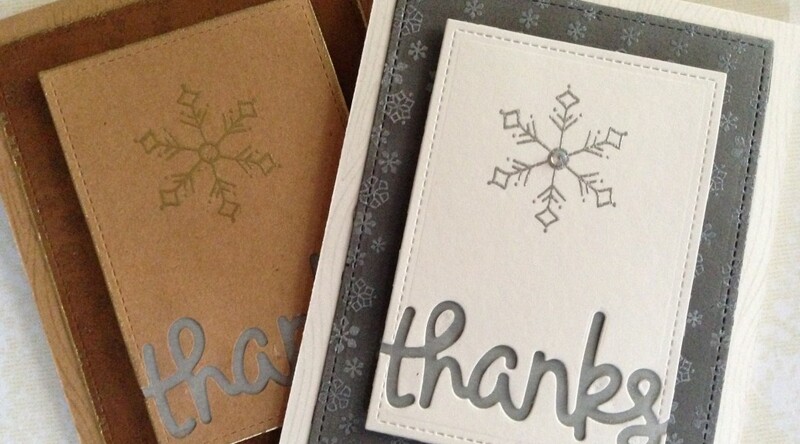 I used white pigment ink to stamp the snow directly on the card base. Lastly, I adhered the stamped panel to the card base, making sure to align the edges with the edges of the snow stamping. 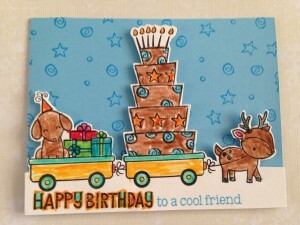 This card was featured on Lawn Fawn’s Fawny Flickr Friday. 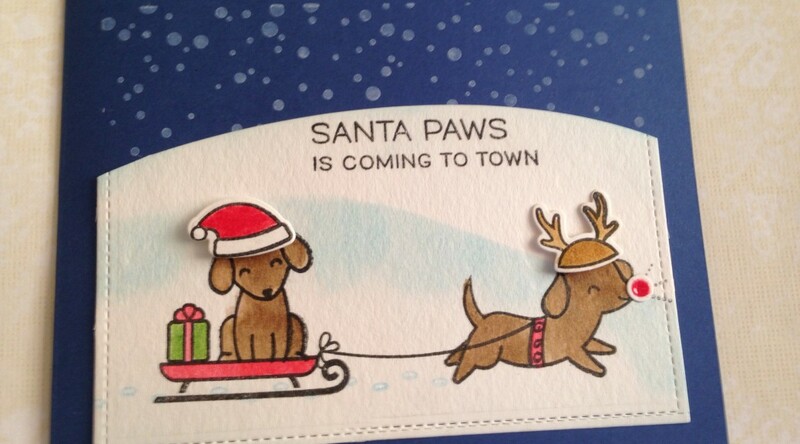 So many fun holiday stamp sets are coming out this year. 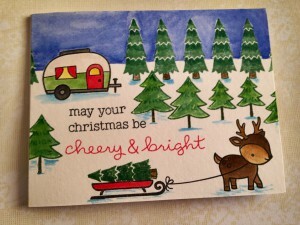 I just saw Essentials by Ellen’s Tree Farm stamp set and fell in love with the concept. I don’t own that set and won’t before Christmas, so I made do with the stamps I have. 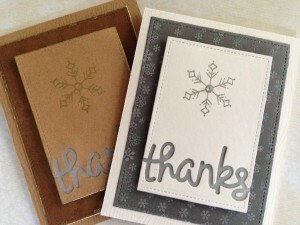 This is just one more thing to love about paper crafting and stamping. Extra Details: I started with a panel of water color paper cut to the exact size of an A2 card front. Next, I stamped my images. I started with the deer, sled, and trailer. I didn’t want to do any masking, so I made sure to stamp the focal images first and build around them. The trees were stamped to fill in the background. I used two different tree stamps to add some interest. I also used a green pigment ink for the solid tree images. Just as I added my last tree on the left hand side, I remembered that I hadn’t stamped a sentiment yet. So, I looked through my stash and found a sentiment that would fit the area I had left. I used Distress Inks to water color everything with. I even used some dark green Distress Ink to add shading to my solid stamp trees. Once all of the Distress Inks were dry, I adhered the panel to a card base and the card was finished. Challenges, Christmas, fun with paper and ink, holiday fun, LOVE! My mother in law is moving into a new house on December 1st. I made this special card for her. I’m hoping I can make her smile in the midst of all the packing/moving craziness. Extra Details: I started with a panel of water color card stock that is 4.25” x 5.5”. I used a die to cut a rounded edge at the top of the panel. Next, I stamped my images and sentiment on the panel. I used a blue pigment ink for the tree. I used red, yellow and green pigment inks to fill in the ornaments and the star. 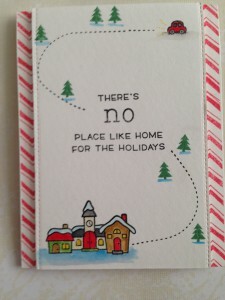 I used the sentiment from Lawn Fawn’s Snow Cool stamp set, but added a few words to fit the situation. I added some ink blending the edges of the panel with Distress inks. I used a scrap of paper to create a mask so I could ink blend in a snow bank also. I, also, used Distress Inks to water color everything in. While the panel was drying, I worked on the card base. I made the card base from dark blue card stock. 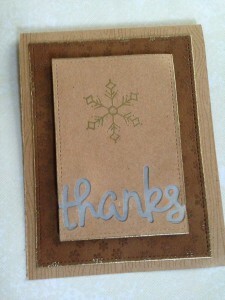 I used Lawn Fawn’s Yeti White Pigment ink to stamp the falling snow on the card base. Once the inks were all dry, I adhered the stamped panel to the card base and the card was complete.